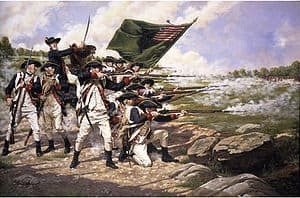 The Battle of Long Island, also known as the Battle of Brooklyn or the Battle of Brooklyn Heights, fought on August 27, 1776, was a major victory for the British and defeat for the Americans under General George Washington. It was the start of a successful British campaign that gave the British control of the strategically important city of New York. In the American Revolutionary War it was the first major battle to take place after the United States declared independence on July 4, 1776. In terms of soldiers, it was the largest battle of the entire conflict. After defeating the British in the Siege of Boston on March 17, 1776, General George Washington, Commander-in-Chief, brought the Continental Army to defend the port city of New York, then limited to the southern end of Manhattan Island. Washington understood that the city’s harbor would provide an excellent base for the British Navy during the campaign. There he established defenses and waited for the British to attack. In July, the British, under the command of General William Howe, landed a few miles across the harbor from Manhattan on sparsely-populated Staten Island, where over the next month and a half they were slowly reinforced by ships in Lower New York Bay, bringing their total force to 32,000 men. With the British fleet in control of the entrance to the harbor at The Narrows, Washington knew the difficulty in holding the city. Believing Manhattan would be the first target, he moved the bulk of his forces there. On August 22, the British landed on the shores of Gravesend Bay in southwest Kings County, across The Narrows from Staten Island, more than a dozen miles south from the East River crossings to Manhattan. After five days of waiting, the British attacked American defenses on the Guan Heights. Unknown to the Americans, however, Howe had brought his main army around their rear and attacked their flank soon after. The Americans panicked, although a stand by 400 Maryland troops prevented most of the army from being captured. The remainder of the army fled to the main defenses on Brooklyn Heights. The British dug in for a siege but, on the night of August 29–30, Washington evacuated the entire army to Manhattan without the loss of materiel or a single life. Washington and the Continental Army were driven out of New York entirely after several more defeats and forced to retreat through New Jersey and into Pennsylvania. Following the Battles of Lexington and Concord on April 19, 1775, the British Army was trapped in Boston. On March 4, 1776, General George Washington, Commander-in-Chief of the Continental Army, had artillery placed on Dorchester Heights. The British Commander, William Howe, knew that he could not hold the city, with the artillery on the heights that would threaten the British Fleet in Boston Harbor. Two weeks later, on March 17, Howe had the army evacuate the city and they headed for Halifax, Nova Scotia. After the British abandoned Boston, Washington began to send regiments to New York City where he believed that the British would attack next because of its strategic importance. Washington left on April 4. The army took a route through Rhode Island and Connecticut, and civilians came out to cheer and offer food and drink to the soldiers. On April 5, the army paraded into Providence and thousands of civilians came out to see Washington and the army. Eight days later, on April 13, Washington arrived in New York. Washington took up headquarters in Archibald Kennedy’s former house on Broadway facing Bowling Green and quickly set to work. In February, Washington had sent his second in command, Charles Lee, ahead to New York to build the defenses for the city. 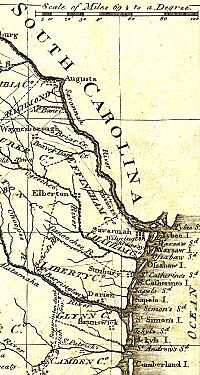 Lee remained in control of the city’s defenses until the Continental Congress sent him to South Carolina in March, and the job of preparing the defenses was left to General William Alexander (Lord Stirling). Because Lee and Stirling had too few troops to do the job, Washington found the defenses only half done. Lee had concluded that if the British commanded the sea it would be impossible to hold the city, so he built his defenses so as to force the British to pay with heavy casualties if they were to take any ground from the Americans. Lee had barricades and redoubts established in and around the city along with a bastion, called Fort Stirling, on Brooklyn Heights, facing the city across the East River. While in New York, Lee sent out troops to clear Long Island of Loyalists. Washington began moving troops to Brooklyn in early May. Within a short time, there were a few thousand men in Brooklyn. On the eastern side of the hamlet of Brooklyn, three more forts were under construction to support Fort Stirling, which stood to the west of the hamlet. The three forts were named Fort Putnam (for Rufus Putnam, not to be confused with the later Fort Putnam at West Point), Fort Greene (for Nathanael Greene) and Fort Box (for Major Daniel Box). Fort Putnam was furthest to the north, with Greene slightly to the southwest and Box slightly further southwest. Each of these forts was surrounded by a large ditch and they were all connected by a line of entrenchments. The forts had a total of 36 cannons, mostly 18-pounders. Fort Defiance was also being built at this time, located further southwest, past Fort Box, near present day Red Hook. In addition to these new forts, a mounted battery was established on Governors Island, cannons were placed at Fort George facing Bowling Green and more cannons placed at the Whitehall Dock, which sat on the East River. Hulks were sunk at strategic locations to deter the British from entering the East River and other waterways. Washington had been authorized by Congress to recruit an army of up to 28,500 men; he had, however, only 19,000 troops when he arrived in New York. There was almost no discipline in the army, and simple orders had to be repeated constantly. Men fired their muskets in camp, ruined their flints, used their bayonets as knives to cut food, and often did not bother to clean their muskets. As this was the first time most men had exposure to others from different regions, there were occasional differences that caused conflict. Due to a shortage of artillerymen, the commander of the artillery, Henry Knox, persuaded Washington to transfer 500 or 600 men who lacked muskets to the artillery. In early June, Knox and Greene inspected the land at the north end of Manhattan and decided to establish Fort Washington there. Another fort, Fort Constitution, later named Fort Lee, was planned for the other side of the Hudson River from Fort Washington. The purpose of these forts was to stop British ships from sailing up the Hudson. On June 28, Washington learned that the British fleet had set sail from Halifax on June 9 and were heading toward New York. On June 29, signals were sent from men stationed on Staten Island that the British fleet had appeared. Within a few hours 45 British ships dropped anchor in Lower New York Bay. Less than a week later, there were 130 ships off Staten Island under the command of Richard Howe, the brother of the General. The population of New York went into panic at the sight of the British ships, alarms went off and troops immediately rushed to their posts. On July 2, British troops began to land on Staten Island. The Continental regulars on the island took a few shots at the British before fleeing and the citizen’s militia switched over to the British side. On July 6, news reached New York that Congress had voted for independence four days earlier. On Tuesday, July 9, at 18:00, Washington had several brigades march onto the Commons of the City to hear the Declaration of Independence read. After the end of the reading, a mob ran down to Bowling Green, where, with ropes and bars, they tore down the gilded lead equestrian statue of George III of Great Britain. In their fury the crowd cut off the statue’s head, severed the nose, and mounted what remained of the head on a spike outside a tavern, and the rest of the statue was dragged to Connecticut and melted down into musket balls. On July 12, two British ships, the Phoenix and the Rose, sailed up the harbor toward the mouth of the Hudson. The American batteries stationed at Fort George, Red Hook and Governors Island opened fire, but the British returned fire into the city. The ships sailed along the New Jersey shore and continued up the Hudson, sailing past Fort Washington and arriving by nightfall at Tarrytown, the widest part of the Hudson. The goal of the British ships was to cut off American supplies and encourage Loyalist support. The only casualties of the day were six Americans who were killed when their own cannon blew up. The next day, July 13, General Howe attempted to open negotiations with the Americans. Howe sent a letter to Washington delivered by Lieutenant Philip Brown, who arrived under the flag of truce. The letter was addressed George Washington, Esq. Brown was met by Joseph Reed, who on Washington’s orders had hurried to the waterfront accompanied by Henry Knox and Samuel Webb. Washington asked his officers whether it should be received or not, as it did not recognize his rank as General, and they unanimously said no. Brown was told by Reed that there was no one in the army with that address. On July 16 Howe tried again, this time with the address George Washington, Esq., etc., etc. but it was again declined. The next day Howe sent Captain Nisbet Balfour to ask if Washington would meet with Howe’s adjutant face to face, and a meeting was scheduled for July 20. Howe’s adjutant was Colonel James Patterson. Patterson told Washington that Howe had come with powers to grant pardons but Washington said, “Those who have committed no fault want no pardon.” Patterson departed soon after. Washington’s performance during the meeting was praised throughout the United States. Meanwhile, British ships continued to arrive. On August 1, 45 ships with Generals Henry Clinton and Charles Cornwallis arrived, along with 3,000 troops. By August 12, 3,000 more British troops and another 8,000 Hessians had arrived. At this point the British fleet numbered over 400 ships, including 73 war ships, and 32,000 troops were camped on Staten Island. Faced with this large force, Washington was unsure as to where the British would attack. Both Greene and Reed thought that the British would attack Long Island, but Washington felt that a British attack on Long Island might be a diversion for the main attack on Manhattan. Washington broke his army in half, stationing half of it on Manhattan, and the other half on Long Island; the army on Long Island was commanded by Greene. On August 20 Greene became ill and was forced to move to a house in Manhattan where he rested to recover. John Sullivan was placed in command until Greene was well enough to resume command. At 05:10, on August 22, an advance guard of 4,000 British troops, under the command of Clinton and Cornwallis, left Staten Island to land on Long Island. At 08:00, all 4,000 troops landed on the shore of Gravesend Bay, unopposed. Colonel Edward Hand’s Pennsylvanian riflemen had been stationed on the shore, but they did not oppose the landings and fell back, killing cattle and burning farmhouses on the way. By noon, 15,000 troops had landed on shore along with 40 pieces of artillery. As hundreds of Loyalists came to greet the British troops, Cornwallis pushed on with the advance guard, advancing six miles on to the island and establishing camp at the village of Flatbush; Cornwallis was given orders to advance no further. Washington received word of the landings the same day they occurred, but was informed that the number was 8,000 to 9,000 troops. This convinced Washington that it was the feint he had predicted and therefore he only sent 1,500 more troops to Brooklyn, bringing the total troops on Long Island to 6,000. On August 24, Washington replaced Sullivan with Israel Putnam who commanded the troops on Long Island. Putnam arrived on Long Island the next day along with six battalions. Also that day the British troops on Long Island received 5,000 Hessian reinforcements, bringing their total to 20,000. Although there was little fighting on the days immediately after the landing, some small skirmishes did take place with American marksmen armed with rifles picking off British troops from time to time. The American plan was that Putnam would direct the defenses from Brooklyn Heights while Sullivan and Stirling and their troops would be stationed on the Guan Heights. The heights were up to 150 feet high and blocked the most direct route to Brooklyn Heights. Washington believed by stationing men on the heights that heavy casualties could be inflicted on the British before the troops fell back to the main defenses at Brooklyn Heights. There were three main passes through the heights; the Gowanus Road furthest to the west, the Flatbush Road slightly farther to the east, in the center of the American line where it was expected the British would attack, and the Bedford Road farthest to the east. Stirling was responsible to defend the Gowanus Road with 500 men, and Sullivan was to defend the Flatbush and Bedford Roads where there were 1,000 and 800 men respectively. 6,000 troops would remain behind at Brooklyn Heights. There was one lesser-known pass through the heights farther to the east called the Jamaica Pass. This pass was defended by just five militia officers on horses. On the British side, General Clinton learned of the almost undefended Jamaica Pass from local Loyalists. Clinton drew up a plan and gave it to William Erskine to propose to Howe. Clinton’s plan had the main army making a night march and going through the Jamaica Pass to turn the American flank while other troops would keep the Americans busy in front. On August 26, Clinton received word from Howe that the plan would be used, and that Clinton was to command the advance guard of the main army of 10,000 men on the march through the Jamaica Pass. While they made the night march, General James Grant’s British troops along with some Hessians, a total of 4,000 men, would attack the Americans in front to distract them from the main army coming on their flank. Howe told Clinton to be ready to move out that night, August 26. At 21:00, the British moved out. No one, except the commanders—not even the officers—knew of the plan. Clinton led a crack brigade of light infantry with fixed bayonets in front, followed by Cornwallis who had eight battalions and 14 artillery pieces. Cornwallis was, in turn, followed by Howe and Hugh Percy with six battalions, more artillery, and baggage. The column consisted of 10,000 men who stretched out over two miles. Three Loyalist farmers led the column toward the Jamaica Pass. The British had left their campfires burning to deceive the Americans into thinking that nothing was happening. The column headed northeast until it reached what later became the village of New Lots when it headed directly north, toward the Heights. The column had yet to run into any American troops when they reached Howard’s Tavern (also known as Howard’s Half-Way House), just a few hundred yards from the Jamaica Pass. 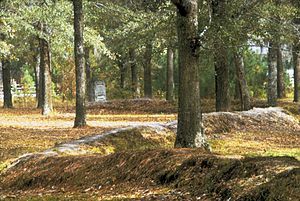 The tavern keeper William Howard and his son William Jr. were forced to act as guides to show the British the way to the Rockaway Foot Path, an old Indian trail that skirted the Jamaica Pass to the west (located today in the Cemetery of the Evergreens). Five minutes after leaving the tavern, the five American militia officers stationed at the Pass were captured without a shot fired, as they thought the British were Americans. Clinton interrogated the men and they informed him that they were the only troops guarding the pass. By dawn the British were through the pass and stopped so that the troops could rest. At 09:00, they fired two heavy cannons to signal the Hessian troops below Battle Pass to begin their frontal assault against Sullivan’s men deployed on the two hills flanking the pass while Clinton’s troops simultaneously flanked the American positions from the east. About 23:00 on August 26, 1776, the first shots of the Battle of Long Island were fired near the Red Lion Inn (near present-day 39th St. and 4th Ave.). American pickets – part of Samuel John Atlee’s Pennsylvania regiment – fired upon two British soldiers who were foraging in a watermelon patch near the Red Lion. Around 01:00 on August 27, the British approached the vicinity of the Red Lion with between 200–300 troops. The American troops fired upon the British and after approximately two fusillades fled up the Gowanus Road toward the Vechte-Cortelyou House. Major Edward Burd who had been in command was captured along with a lieutenant and 15 privates. This first engagement was fought in the vicinity of 38–39 streets between 2nd. and 3rd. avenues near a swamp located adjacent to the Gowanus Road. Newly promoted Brigadier General Samuel Holden Parsons a lawyer from Connecticut who had recently secured a commission in the Continental Army, and Colonel Samuel Atlee in command of the First Regiment of Pennsylvania Musketry – a veteran of the French and Indian War – were stationed further north on the Gowanus Road. Putnam had been awakened by a guard at 03:00 and told that the British were attacking through the Gowanus Pass. Putnam lit signals to Washington who was on Manhattan and then rode south to warn Stirling of the attack. In part due to the ferocity of the fighting and the number of British troops engaged, the Americans were still unaware that this was not the main British attack. The Hessians, in the center under the command of General von Heister, began to bombard the American lines stationed at Battle Pass under the command of General John Sullivan. The Hessian brigades, waiting for the pre-arranged signal from the British, who at that time were in the process of outflanking the American lines did not attack. The Americans, still under the assumption that Grant’s attack up the Gowanus Road was the main thrust had Sullivan send four hundred of his men to reinforce Stirling. Howe fired his signal guns at 09:00 and the Hessians began to attack up Battle Pass while the main army came at Sullivan from the rear. Sullivan left his advance guard to hold off the Hessians while he turned the rest of his force around to fight the British. Heavy casualties mounted up between the Americans and the British and men on both sides fled out of fear. Sullivan attempted to calm his men and tried to lead a retreat. By this point the Hessians had overrun the advance guard on the heights and the American left had completely collapsed. Hand-to-hand fighting followed with the Americans swinging their muskets and rifles like clubs to save their lives. Many of the Americans who surrendered were bayoneted by the Hessians. Sullivan, despite the chaos, managed to evacuate most of his men to Brooklyn Heights though Sullivan himself was captured. At 09:00, Washington arrived from Manhattan. Washington realized that he had been wrong about a feint on Long Island and he ordered more troops to Brooklyn from Manhattan. Washington’s location on the battlefield is not known for sure, because accounts differ, but most likely he was at Brooklyn Heights where he could view the battle. On the American right, to the west, Stirling still held the line against Grant. Stirling held on for four hours, still unaware of the British flanking maneuver, and some of his own troops thought they were winning the day because the British had been unable to take their position. However, by 11:00, Grant, reinforced by 2,000 marines, hit Stirling’s center and Stirling was attacked on his left by the Hessians. Stirling pulled back but British troops were, at this point, coming at him in his rear south down the Gowanus Road. The only escape route left was across a Brouwer’ Millpond on the Gowanus Creek which was 80 yards wide, on the other side of which was Brooklyn Heights. Stirling ordered all of his troops, except a contingent of Maryland troops under the command of Major Mordecai Gist, to cross the creek. This group of Maryland troops became known to history as the Maryland 400, although they numbered about 260–270 men. Stirling and Gist led the troops in a rear-guard action against the overwhelming numbers of British troops which surpassed 2,000 troops supported by two cannon. Stirling and Gist led the Marylanders in two attacks against the British who were in fixed positions in and in front of the Vechte-Cortelyou House (known today as Old Stone House). After the last assault the remaining troops retreated across the Gowanus Creek. Some of the men who tried to cross the marsh were bogged down in the mud under musket fire and others who could not swim were captured. Stirling was surrounded and, unwilling to surrender to the British, broke through the British lines to von Heister’s Hessians and surrendered to them. 256 Maryland troops were killed in the assaults in front of the Old Stone House and fewer then a dozen made it back to the American lines. Washington, watching from a redoubt on nearby Cobble Hill (intersection of today’s Court Street and Atlantic Avenue), was to have said, “Good God, what brave fellows I must this day lose!”. After those American troops not killed or captured escaped behind the fortified American positions centered on Brooklyn Heights. Howe, in a move considered controversial to this day, ordered all of his troops to halt the attack, despite the protestations of many of the officers in his command who believed that they should push on to Brooklyn Heights. Howe had decided against a direct frontal assault against the entrenched American positions choosing instead to begin a siege and setting up lines of circumvallation around the American positions who he believed to be essentially trapped with his troops blocking escape by land and the Royal Navy in control of the East River which they would have to cross to reach Manhattan Island. Washington and the army were surrounded on Brooklyn Heights with the East River to their backs. As the day went on, the British began to dig trenches, slowly coming closer and closer to the American defenses. By doing this, the British would not have to cross over open ground to assault the American defenses as they did in Boston the year before. Despite this perilous situation, Washington ordered 1,200 more men from Manhattan to Brooklyn on August 28. The men that came over were two Pennsylvania regiments and Colonel John Glover’s regiment from Marblehead, Massachusetts. In command of the Pennsylvania troops was Thomas Mifflin who, after arriving, volunteered to inspect the outer defenses and report back to Washington. In these outer defenses, small skirmishes were still taking place. On the afternoon of August 28, it began to rain and Washington had his cannon bombard the British well into the night. As the rain continued Washington sent a letter instructing General William Heath, who was at Kings Bridge between Manhattan and what is now the Bronx, to send every flat bottomed boat or sloop without delay in case battalions of infantry from New Jersey might come to reinforce their position. At 16:00, on August 29, Washington held a meeting with his generals. Mifflin advised Washington to retreat to Manhattan while Mifflin and his Pennsylvania Regiments made up the rear guard, holding the line until the rest of the army had withdrawn. The Generals agreed unanimously with Mifflin that retreat was the best option and Washington had orders go out by the evening. The troops were told that they were to gather up all their ammunition and baggage and prepare for a night attack. By 21:00, the sick and wounded began to move to the Brooklyn Ferry in preparation for being evacuated. At 23:00, Glover and his Massachusetts troops, who were sailors and fishermen, began to evacuate the troops. As more troops were evacuated, more troops were ordered to withdraw from the lines and march to the ferry landing. Wagon wheels were muffled, and men were forbidden to talk. Mifflin’s rear guard was tending campfires to deceive the British and convince them that nothing was going on. At 04:00, on August 30, Mifflin was informed that it was his unit’s turn to evacuate. Mifflin told the man who had been sent to order him to leave, Major Alexander Scammell, that he must be mistaken, but Scammell insisted that he was not and Mifflin ordered his troops to move out. When Mifflin’s troops were within a half mile of the ferry landing Washington rode up and demanded to know why they were not at their defenses. Edward Hand, who was leading the troops, tried to explain what had happened, but Mifflin arrived shortly. Washington exclaimed “Good God! General Mifflin, I am afraid you have ruined us!” Mifflin explained that he had been told that it was his turn to evacuate by Scammell; Washington told him it had been a mistake. Mifflin then led his troops back to the outer defenses. Artillery, supplies, and troops were all being evacuated across the river at this time but it was not going as fast as Washington had anticipated and daybreak soon came. A fog settled in and concealed the evacuation from the British. British patrols noticed that there did not seem to be any American pickets and thus began to search the area. While they were doing this Washington, the last man left, stepped onto the last boat. At 07:00, the last American troops landed in Manhattan. All 9,000 troops had been evacuated without a single life lost. The British were stunned to find that Washington and the army had escaped. The next day, August 30, the British troops occupied the American fortifications. When news of the battle reached London, it caused many festivities to take place. Bells were rung across the city, candles were lit in windows and King George III gave General Howe the Order of the Bath. Washington’s defeat revealed his deficiencies as a strategist who split his forces, his inexperienced generals who misunderstood the situation, and his raw troops that fled in disorder at the first shots. On the other hand his daring nighttime retreat has been seen by some historians as one of his greatest military feats. Other historians concentrate on the failure of British naval forces to prevent the withdrawal. General Howe remained inactive for the next half month, not attacking until September 15 when he landed a force at Kip’s Bay. The British quickly occupied the city. On September 21, a fire of uncertain origin destroyed a quarter of New York City. In the immediate aftermath of the fire Nathan Hale was executed for spying. 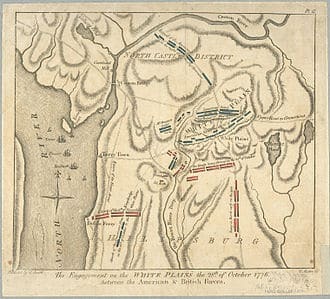 Although the Continentals were able to mount a victory at Harlem Heights in mid-September, Howe defeated Washington in battle again at White Plains and then again at Fort Washington. Because of these defeats, Washington and the army retreated across New Jersey and into Pennsylvania. * The Altar to Liberty: Minerva Monument: The battle is commemorated with a monument, which includes a bronze statue of Minerva near the top of Battle Hill, the highest point of Brooklyn, in Green-wood Cemetery. The statue was sculpted by Frederick Ruckstull and unveiled in 1920. The statue stands in the northwest corner of the cemetery and gazes directly at the Statue of Liberty in New York Harbor. In 2006, the Minerva statue was invoked in a successful defense to prevent a building from blocking the line of sight from the cemetery to the Statue of Liberty in the harbor. The annual Battle of Long Island commemoration is held inside the main Gothic Arch entrance in Green-Wood Cemetery.